Welcome to Art Gallery of Prehistoric World Images presented by Dinosaur Corporation. 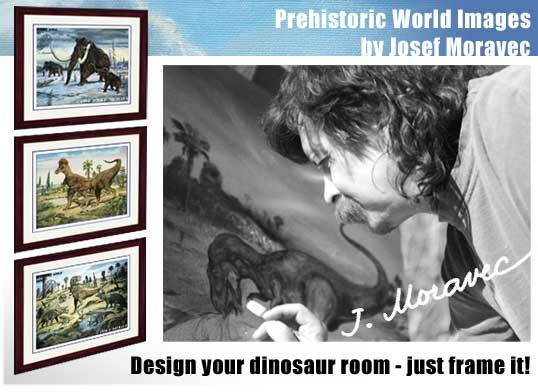 This Unique Dinosaur Art Collection of over 70 Oil paintings of Permian, Jurassic, Cretaceous Dinosaurs, Prehistoric Mammals, Ice Age Animals and pictures of their habitat, that you are about to see is the work of paleo-artist Josef Moravec. He has devoted more than 40 years discovering, studying and bringing to life on canvas this incredible "Lost World". You are about to embark on a visual journey across billions of years in the evolution of Earth Science. Few other artists have re-created this world of great dinosaurs with such attention to detail, depth of feeling, or profound sense of history. For those interested in the exciting, dramatic era of prehistory and the age of dinosaurs, check out our impressive collection of images from world renowned artist and illustrator Josef Moravec. Painted with meticulous detail and gorgeous colors, his renderings of the journey from the Precambrian era to the land and creatures of the Pleistocene Epoch will delight and amaze you. A unique collection of beautifully rendered and finely detailed oil paintings of our prehistoric world, from the Precambrian Era 4.6 billion years ago through the Pleistocene Epoch 20,000 years ago. These true-to-life images open a window on a world lost to history, surviving only in the rare fossils and painstaking re-creations found in Museums of Natural History, and in the work of dedicated artists like Josef Moravec. Dinosaur Exhibits to Museums, Discovery Centers, Schools and Libraries!